This week’s French Fridays with Dorie recipe was deliciously simple. 1. Cut an avocado in half. 2. Take out the pit. 3. Sprinkle some lemon juice and salt. 4. Fill hollow with pistachio oil. Two out of my three kids are allergic to nuts, one is anaphylactic, so I knew there’d be no pistachio oil for us! So from the start I knew a lemon and salt combo was going to be as exciting as it was going to get in our family. On the up side, I knew it would be eaten. I deliberated on all of Dorie’s Bonne Idee’s and settled on having the avocado with the Lemon-Grilled Chicken. I was starting to get excited! The last piece of the puzzle was Ree Drummond’s Mexican Rice Casserole. I have had a page on my iphone permanently devoted to this dish for a couple of weeks now. I have been searching for easy to prepare dishes that can fit into our hectic lifestyle. I love Mexican food, but it’s not that common here in Australia. Or at least not as common as Thai, Indian and Italian. 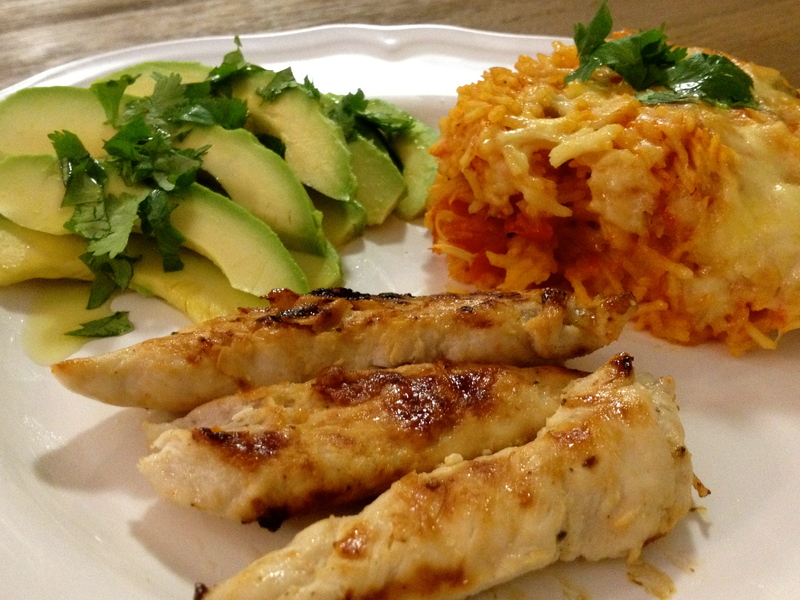 So when I saw the Mexican Rice Casserole… well… it ticked all the boxes! And the Pioneer Woman’s recipe had so many rave reviews I had to try it. I made half the recipe and it was more than enough for a family of 5. It was simple, tasty and the kids loved it! The recipe is here if anyone is interested. The Avocado was perfect with some lemon infused extra virgin olive oil and salt. The coriander (cilantro) leaves lifted the flavours just that bit extra. I will be making this combination again, might even add the chicken to the rice casserole next time and top it off with the avocado slices. The husband loved it, the kids loved! I am looking forward to hearing what the rest of the French Fridays with Dorie Group thought of the recipe and especially of the avocado / pistachio combo! Tags: avocado, baking, cooking, food, french fridays with dorie, mexican, recipes, rice | Permalink. I love Ree Drummond and all of her recipes. I have yet to try this one but it looks amazing! Thanks for sharing! I read Ree’s blog often, but have yet to cook any of her recipes. They all look good, so I don’t know what’s holding me back. Looks like a great meal! That is a combination I could really love! It looks delicious!!! I made mine per the recipe, with home made pistachio oil. While tasty, I would have enjoyed yours more!!! What a fantastic meal! I also made the lemon-grilled chicken and thought it was perfect with the avocado. The rice casserole rounds out your meal so nicely! What a great dinner. My daughter is allergic to nuts but her allergy has subsided a lot since she was little, it is a frightening thing to live with and my son and I love nuts. What a wonderful dinner! Off to check out the rice casserole…sounds amazing!!! There is really nothing I can think of that isn’t made better with a fan of avocado sitting next to it like that! What a great combination! I thought about making the lemon chicken to go with it, too, and now I wish I had. That whole plate looks divine- I would love to sit down and enjoy it myself 🙂 Good for you to try the avocado recipe sans nut oil, given the health issues in your house I might have skipped the recipe entirely but as you found- it the lemon, olive oil combo is just wonderful too. And I enjoy that Ree Drummond as well – she has great recipes and wonderful outlook on life, family and cooking. I have yet to try the lemon grilled chicken! And yours look fantastic! Lovely dish great idea to combine these two recipes into one very inviting meal!! An absolutely scrumptious looking meal! The lemon grilled chicken sounds amazing! What a bonne idee, Sanya! That meal looks amazing.